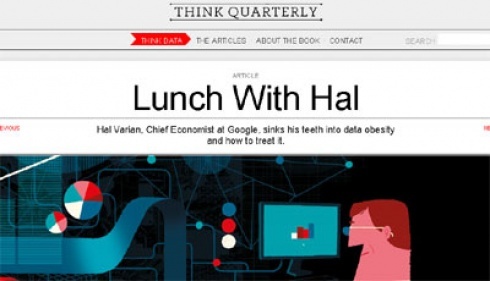 Google launched an online magazine called Think Quarterly. Magazine published every three months comes the first time in Britain and Ireland. Think Quarterly first edition has come with 68 pages, most discussed topics around issues of business and technology, with a style of writing in-depth as it is commonly found in the BusinessWeek or Salon. In this edition, Google presents some writing features on Vodafone UK CEO Guy Laurence, Google Chief Economist Hal Varian and Peter Kruse famous psychologist. The writings in this edition are many written by reporters from other media, such as Simon Rogers (editor rubric Datablog in The Guardian), Ulrike Reinhard (editor of WE Magazine). In a note on the magazine website, Google's director of operations for the UK and Ireland, Matt Brittin said Think Quarterly is the place to get fresh air in the middle of the fatigue and bustle of everyday.